Press Row, a discussion of sports video gaming and current topics in the industry and the sports they reflect, debuted yesterday. It's a collaboration of some of the biggest publications and sites dedicated to the subject, including Operation Sports, GamesRadar and Polygon. I was one of the panelists in the debut discussion. 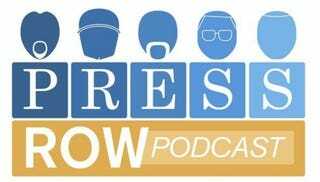 Press Row has plans to publish bi-weekly and I hope to be a regular panelist for the discussion. In week one, host Rich Grisham leads OS's Steve Noah, Polygon's Samit Sarkar, and me through a look at the current state of sports video gaming, including how the genre may be made more accessible, the sustainability of the current business model, and how it will transition to the new console generation. See Operation Sports for details on the episode and instructions on how to download and listen to it.